Dance Journey - "Find your freedom on Fridays!" ...don't feel comfortable in a nightclub environment? ...feel shy about dancing "in public"? ...don't want to have to learn steps? ...need an inspiring choice of music to encourage you to move? ...you're not sure where to start? ...you don't have a partner to dance with? There's a public car park nearby - only payable up to 8pm, so a 1-hour duration parking ticket will cover you for the whole evening. "Oh my goodness, that was the most exhilarating, fun, relaxing and amazing dance experience of my life!" "The best night I've had on the dancefloor ever!" "What fabulous music - so inspiring, I just couldn't sit down!" "A wonderfully safe space in which to be myself"
"I'm coming to the next one even if I have to crawl to get there!" For each of our Dance Journeys, Jo-Anne will be offering a short warm-up with gentle movement at the start of each session (7.45-8pm) to help us switch off our minds and tune into the body. There will be several opportunities through the evening to dance with a partner or partners if desired, but most of all Jo-Anne will be encouraging us to rediscover the simple joy of exploring our movement and expressing ourselves to music. PLEASE NOTE there will be no admission after 8pm. Bayshill Unitarian Church, Royal Well Lane, Cheltenham GL50 3DN. Close to the famous Promenade, with the Royal Well Bus Station nearby. See map and picture below. 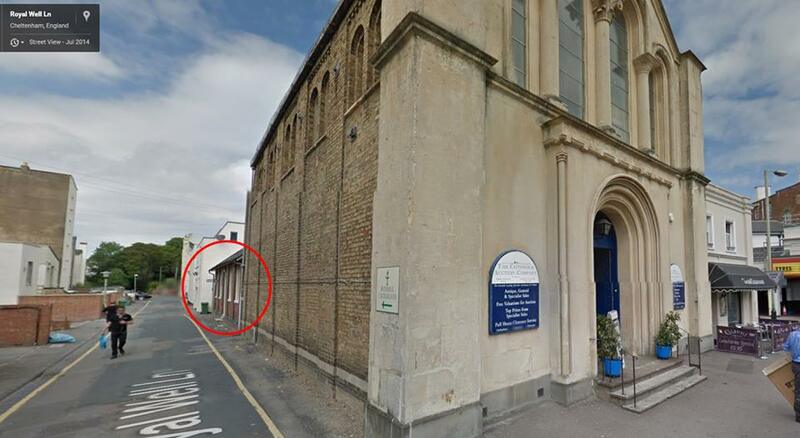 The hall is situated at the back of the building (indicated by the red circle) and the entrance is off the lane to the right hand side (not visible in the photo).